Sure… Mt. Yasur’s volcanic magma source looks a long ways away from the rim viewing area. Just wait…. Tanna, Vanuatu. Mt. Yasur, Tanna, Vanuatu’s volcano…. Vanuatu: Tanna near Mt. Yasur. These undulating hills of ferrous red rock glowed in the ensuing dusk. Would’ve loved to hike them. Before we set sail for the South Pacific, we asked fellow Pearson owner and friend, Dirk of Evening Ebb, what the greatest highlights were of his South Pacific sojourn. 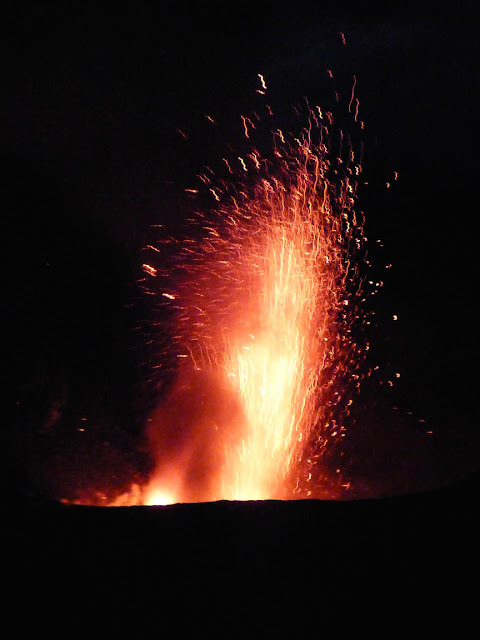 Vanuatu’s volcanically active Mt.Yasur on Tanna topped his list. “It’s worth it, a definite don’t miss,” he insisted, despite having to pay for the ride to it, the entry fee, and the guide. so pretty I couldn’t resist a photo from inside the 4-wheel-drive. Tanna, Vanuatu. Yes, we’ve lived in the shadow of Washington State’s infamously explosive Mt. Saint Helens. We’ve visited the lava-expanding big island of Hawaii. 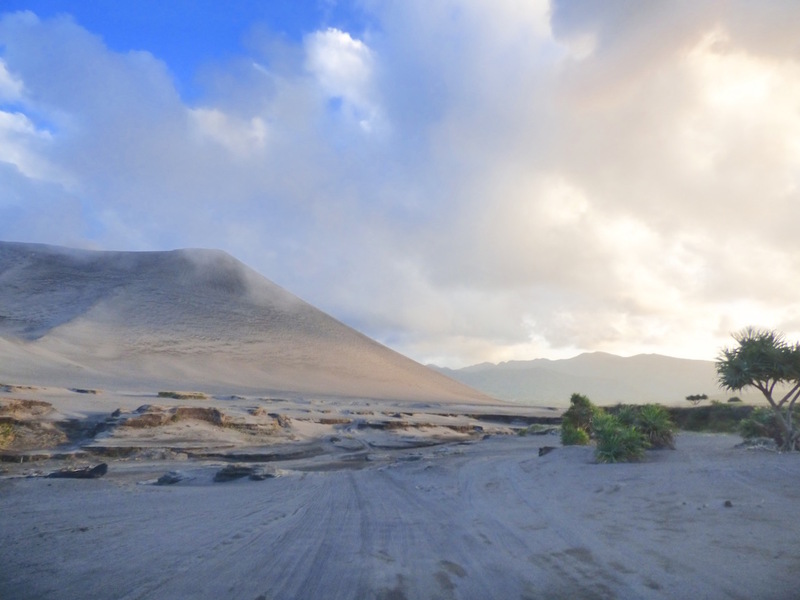 We explored the bygone splendor of Martinique’s St. Pierre. Our boat got dusted with volcanic ash from Mt. Montserrat in the Caribbean despite our needing to give the island itself a miss. We delighted in New Zealand’s geothermal wonders, and I loved the Auckland Museum’s special volcanic exhibition. Having narrowly missed the volcanic caldera view of Ambrym’s Mt. Marum, even though Wayne was chomping at the bit to leave Vanuatu and move on to New Caledonia, he wanted to honor my insistence on seeing Mt.Yasur. “I’ll wait for you in Port Vila,” he promised, noting seeing Yasur was not that important to him. Even if the sail to Tanna from Vila wasn’t an unpleasant upwind bash, it meant we were missing that same rarified weather window required for a nice passage to New Caledonia. 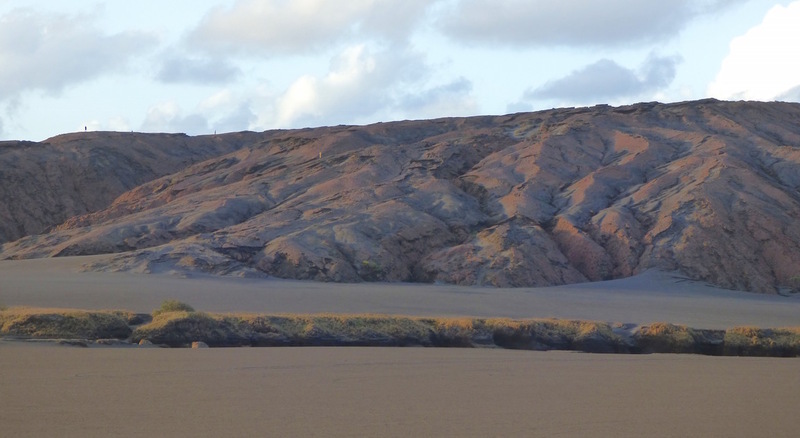 Then a magnificent sandy pyramid arose from the ash plain. Tanna, Vanuatu. 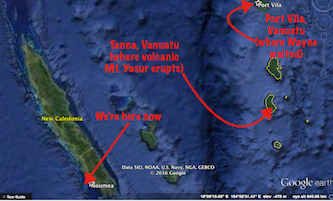 What makes Tanna’s Mt. Yasur so unique? Mt. 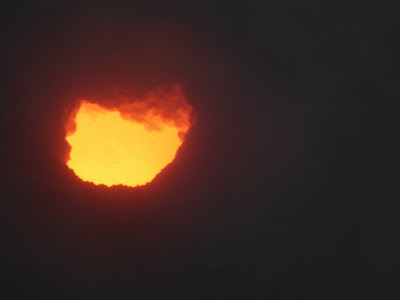 Yasur spews molten lava almost as reliably as Yellowstone’s Old Faithful geysers. And, like at Yellowstone, you’re able to get close enough to see, feel, hear and even smell it erupt, without too great a risk of life and limb. 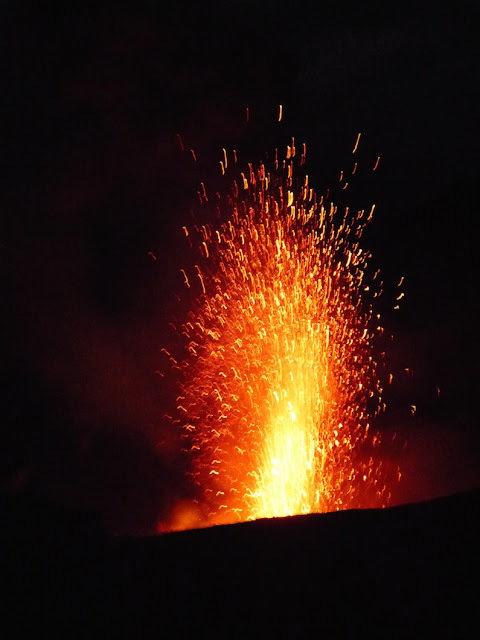 In fact, sometimes areas are closed off because its eruptions are too boisterous. Mt. Marum had been this easy! Mt. Yasur, Vanuatu. “Yasur was a little too Disneyland-ish,” Mark Silvestein of Field Trip complained. Of course, he’d made it to Ambrym’s Mt. 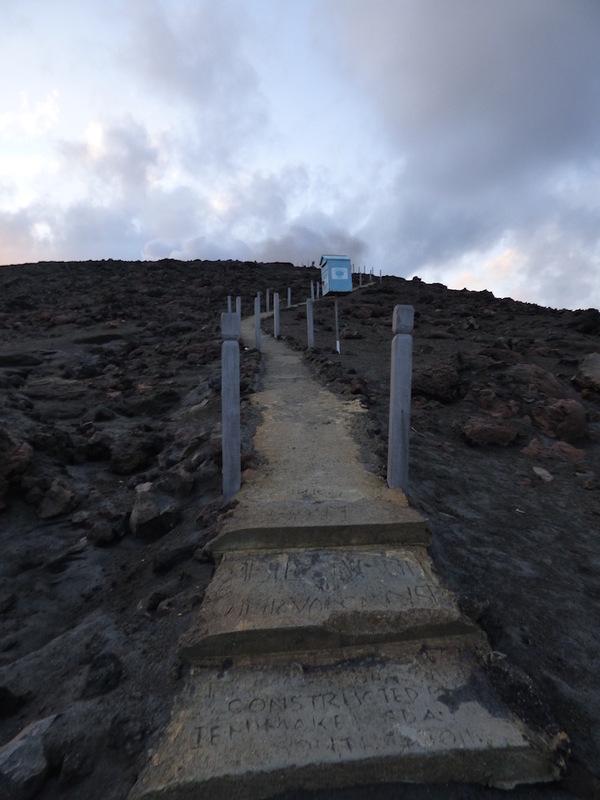 Marum ridge top, a feat only a few can claim compared to the easily accessible Yasur. What’s more, he even filmed its pulsating cauldron via drone (click here to check outhis awesome Ambrym Mt. Marum video). Indeed, part of what made the hike to Mt. Marum awesome was the fabulous scenery leading up to it… stunning rugged mountainous and coastline vistas, dramatic charcoal-colored lava plains, punctuated by brilliant green jungle growth. 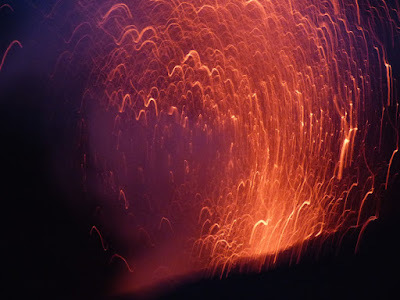 And always, there is the startling sharp, vertical thrust of the lava cone itself, a sure signal of a violently fiery emergence from the center of the earth. Personally, it’s a sight that unfailingly makes me gasp in awe of nature’s power. While less dramatic in color, Mt. Yasur’s tawny ash is more akin to New Zealand’s shapely sand dunesoff its famed “90 mile drive.” I suspect the passage to Mt. Yassur’s lovely prelude to its cone has been almost entirely usurped by 4-wheel drive tours. As we whizzed past Yasur’s gorgeous plains, I pined for the leisurely exploration afforded by Mt. Marum’s mostly excellent hiking trails. Then again, we were also racing to reach Mt. Yassur by sunset, and we were running quite late. Our lateness spared us the literal kustom song-and-dance show at the Mt. Yasur visitor center, though they were still quick to collect their entire $75/person entry fee. Apparently just a few months before, the entry fee was only half that. Just across the road from Mt. Yasur’s visitor center is Yasur View Bungalows, where I’d originally planned to camp. Again, while the bungalows were a mere 3 clicks (kilometers, or 2 miles) from Mt. Yasur’s ridge point, the dirt road there was a veritable dust cloud from the 4 wheel drive’s passage in. Was there a dust-free walking path to Mt. Yasur’s ridge point? If not, I too would’ve succumbed to a 4-wheel drive in even from nearby Yasur View Bungalows. Ahhh, my first acrid but stunning taste of what all the Mt. Yasur fuss is about. In fact, much as I ached to explore that whole volcanic plain as much or more than the explosive volcano itself, I have never, ever been anyplace dustier than Tanna. Considering how many countries I’ve been – that’s saying a lot! 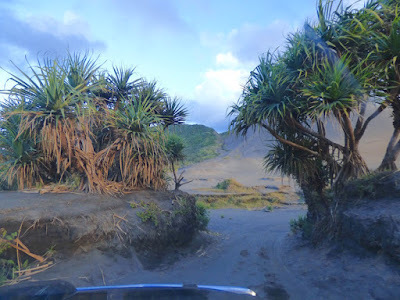 It’s not just the volcanic ash, it’s the fine soil of the road; with few exceptions, all the Tanna roads I traveled were unpaved. None of these minor complaints supersede Yasur’s genuinely spectacular draw…. It’s little more than a few minutes walk up from the parking lot along a well-defined path and – wow! -- you’re overlooking an obviously active caldera. Hellfire and brimstone – forget that namby-pamby revivalist stuff – this is the real deal! Mt. Yasur belches its powerfully noxious sulfur brew in clouds of steamy pale grey, dark black and red-orange smoke. It’s stinky. It’s gritty. It rumbles, roars and then… it EXPLODES! Did I mention acrid? So I followed these guys (and gals), Mt. 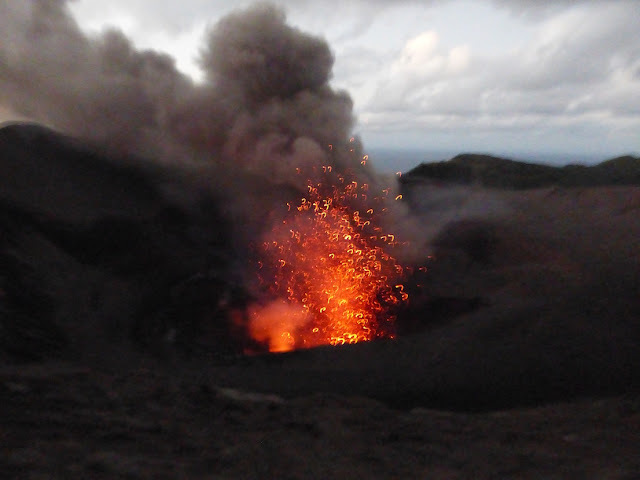 Yasur volcano, Vanuatu. You find yourself noticing a file of hikers on another part of the caldera’s ridge. Hmmm, they seem to be upwind, and seems their view is as good or better. Dusk ushers in darkness. Quickly, I follow in the ridge-walker’s footsteps. The ridge is a little loose, but wide and well marked, even in the semi-darkness. Ahhh… I’m upwind of the grit, sulfer and smoke. I stop. It’s either that, or run like hell! I look. The primordial drumbeat resumes. Sometimes, that BOOM! merely precedes a puff of red-tinged smoke, like a wily magician, deftly transitioning between acts. Other times the explosions are followed by a gigantic yellow-white towering fountain of flame, casting red-orange sparks in its wake. No longer able to defy the laws of gravity, the sparks then streak their streaming way earthward. Thanks to a 60x zoom, here’s a (safely) closer look at Mt. Yasur’s seething magma. Glowing red against a black background, you realize that orange firework display that shot into the sky well above your head is comprised of molten lava…. Oh, wow! A white-hot fire tower and crimson smoke! Mt. 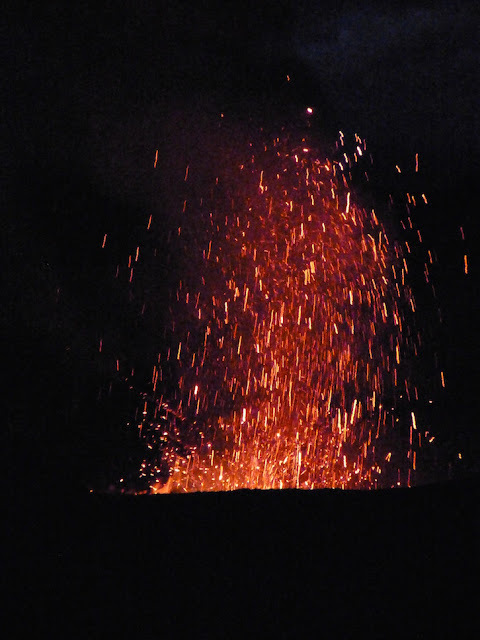 Yasur volcano, Vanuatu. This was my favorite part of Mt. Yasur’s molten fireworks display. Vanuatu. What goes up, must come down, as evidenced at Mt. Yasur, Vanuatu. 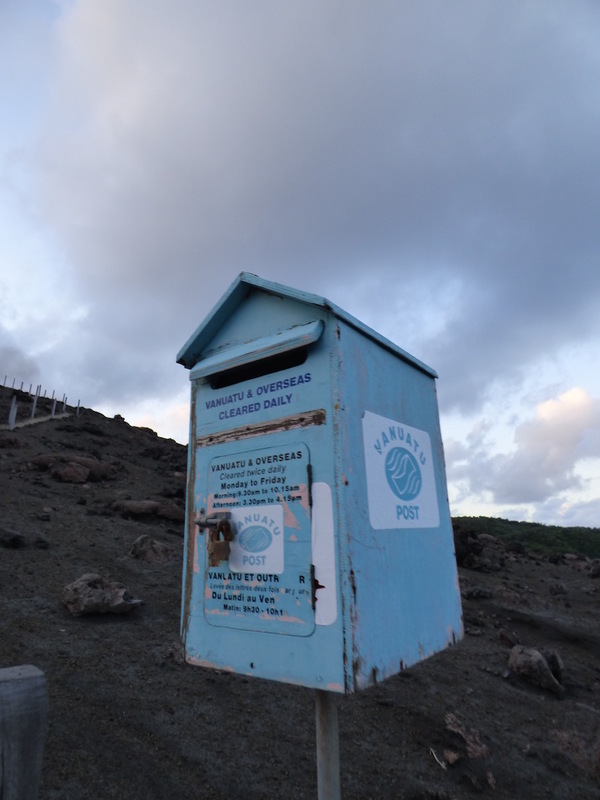 This is a recent retrospective of when I went to Tanna Sunday, September 13, returning Wednesday the16, 2016. Wayne and Journey remained at "our" Yachting World mooring (S17.44.750 E168.18.729) in Vanuatu’s Port Vila. We're currently in New Caledonia, where we arrived September 21, 2016; this post was written while at anchor Noumea, New Caledonia (S22.16.695 E166.25.688). We're currently cruising the country. There’s still a few more Vanuatu posts to catch up on. 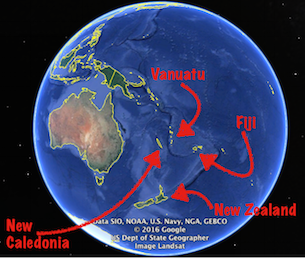 While this post is about our last country, Vanuatu, we're currently in New Caledonia. This Google Earth.map shows both.